These were the first scientific calculators manufactured in the Soviet Union. The Rockwell 61R for comparison. Distinctive features: The Elektronika B-18 was the first scientific calculator made in the Soviet Union. The B-18A is an improved version. Display is 8 digits, green VFD (Vacuum Fluorescent Display). Integrated circuits - Type K145/n7n, here date coded early 1979. 6v (4 x large button cells) . 90 x 158 x 40 mm (3.5" x 6.2" x 1.6"). Made in USSR (Union of Soviet Socialist Republics). 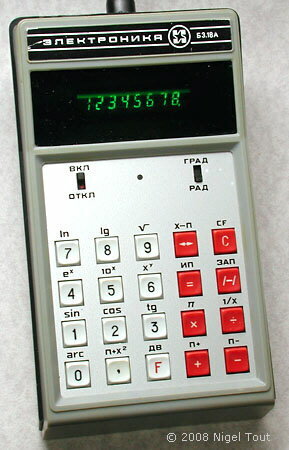 Elektronika (meaning Electronic) calculators were produced in the USSR from 1974 to the early 1990s. Most of the markings on the keys are familiar, but some use the Cyrillic alphabet. The batteries required are of a type only available within the USSR and neighbours. The B-18A keyboard and functions are very similar to the Rockwell 61R, so it is likely that there was a technology transfer. 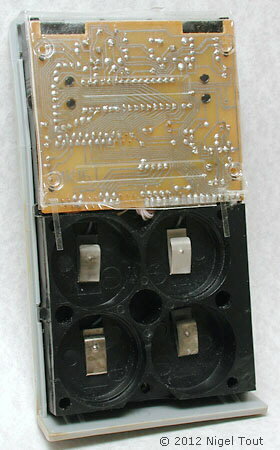 Removing the back reveals the sockets for the large button cells used to power the calculator. Here the circuit board has been rotated to reveal the components including the integrated circuit and the vacuum-fluorescent (VFD) tube. 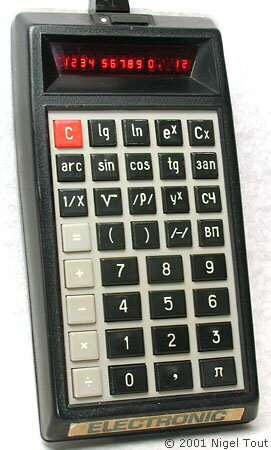 Distinctive features: Scientific calculator made in the Soviet Union. Display is scientific, 10 digits mantissa & 2 digits exponent, red LED. Integrated circuits - At least 7, Soviet manufactured, one here date coded early 1976. 6v (4 x CNK0.45 batteries) . 88 x 170 x 31 mm (3.5" x 6.7" x 1.25"). Made in USSR (Union of Soviet Socialist Republics) by the Svetlana company of Leningrad (now St. Petersburg, Russia). Strangely this example has the Elektronika name covered by a sticker displaying "Electronic", maybe for a market outside the USSR. 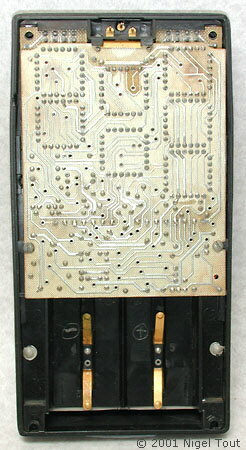 The rear circuit board showing the integrated circuits in circular packages. Inside the rear. The terminals for the unusual batteries are at the bottom. The USSR lagged behind the West and Japan in semiconductor and display technology. 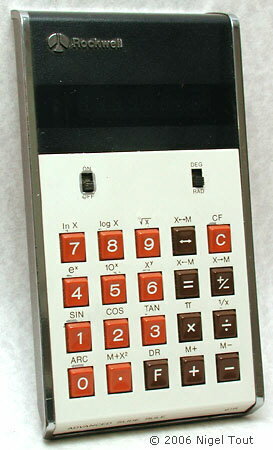 Their first hand-held calculator developed in great haste and introduced in 1973 appears to have been largely based on imported technology. Many models with largely local electronics were subsequently produced under the Elektronika name, but in general look dated when compared with the models of the West and Asia of the same period. 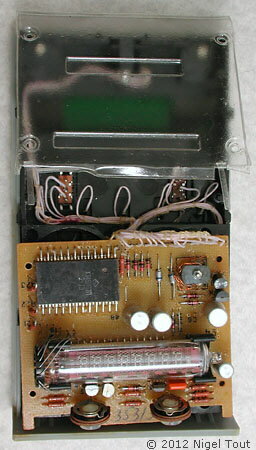 See also the page on this site about the MK33 with LED display from 1990.
and Sergei Frolov's Soviet Calculator Museum site at http://www.xnumber.com/xnumber/russian_calcs.htm.